Birds of prey are being drafted in to help deal with problem pigeons posing a health risk in a Northamptonshire town centre. Peregrine falcon Grin and saker falcon Jackson will patrol the skies above Daventry while Harris hawks Goose and Ruby are walked around the streets in an effort to scare the pigeons away. 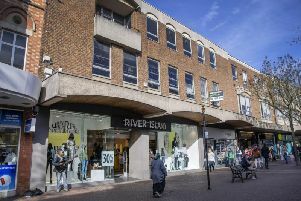 The action is being taken by Daventry District Council in response to concerns over the growing number of pigeons creating a mess in the town, particularly Bowen Square and Foundry Place. As well as looking unsightly, bird droppings carry disease and can erode stonework on buildings and block gutters. During an intensive fortnight-long programme, experienced handlers from NBC Bird and Pest Solutions will fly their falcons in a wide arc around the town centre, deterring pigeons from roof tops and balconies. The Harris Hawks will be walked around the town to move the pigeons from paths and walkways. The birds of prey will then be brought back to the town periodically to deter the pigeons from returning. Birds of prey are increasingly being used as an effective deterrent to pigeons and other unwanted birds. Rufus, the Harris Hawk, has been keeping the Wimbledon tennis championships pigeon-free for many years, while NBC have carried out their falconry programme in a number of town and city centres in the East Midlands as well as at Luton Airport. Jon Bailey, of NBC Bird and Pest Solutions, said: “Our falconry response programmes create a visual deterrent, letting the pest birds know that the area is no longer safe. “The presence of a hawk or falcon quickly makes an area undesirable to feral pigeons and encourages them to establish a new pattern of behaviour. Environmental Health Officers from DDC are urging people to support the programme by not feeding the pigeons. Those who do so are being reminded they risk a £75 fixed penalty notice for littering. People are also being given an opportunity to meet the birds of prey and find out more about the falconry programme at an information event this Saturday (October 24). It will run from 9am to about 4pm in Bowen Square, ahead of the falconry programme starting on Monday, October 26. Councillor Mike Warren, Health and Housing Portfolio Holder on Daventry District Council, said: “Unfortunately despite our efforts to stop people feeding the pigeons their numbers continue to grow, creating a mess in the town centre and posing a health risk to our residents.